State and local policymakers are starting to replace the often-cursory teacher observations of the past with more comprehensive and meaningful practices. But as these new systems roll out, there is mounting evidence that principals alone can’t manage the burdens they impose. In response, a number of districts are using multiple raters to observe and judge teacher performance. This report looks at the design, implementation, and challenges of multi-rater systems in 16 districts. 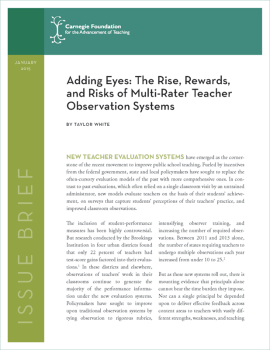 This is the second in a series of reports on issues emerging from new teacher evaluation systems in states and school districts. Read the first brief, Evaluating Teachers More Strategically: Using Performance Results to Streamline Evaluation Systems.